Calvin O'Neal, born on Ocracoke in 1925, lived directly across the lane from the Methodist Church. For most of his adult life Calvin was a pillar of the church. He sang in the choir, acted as custodian, was a lay preacher, and gave many hours in service to his church and his community. Calvin never had a driver's license. For years he walked from his home, then down East Howard Street, to the electric company office (the small building at the base of the dock leading to the Ocracoke Watermen's Exhibit) where he worked. Calvin loved to laugh, sing and act. He performed in numerous local productions, and was a founding member of the Sea Flats, an island barbershop quartet. In recent years, because of declining health, Calvin seldom left his home. He died at home on April 17. Family and friends gathered at the Methodist Church on Saturday to celebrate his life. Another link to the Ocracoke before paved roads and ferries has been broken. 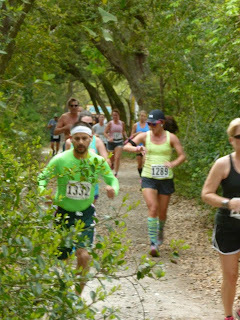 To read more about Calvin, click on this link to the Ocracoke Current: http://www.ocracokecurrent.com/21040. On Thursday I mentioned that a neighbor told me there are 29 non-profit organizations on Ocracoke. A reader asked me to list them all. I am not sure who counted the 29 organizations. However, I have come up with my own list. I can't guarantee that every one of these is a registered 501(c)(3) non-profit, but each one has island residents who volunteer many hours to benefit this community.They are listed in no particular order. Some of the following may not qualify because their offices are not located on Ocracoke (though many islanders volunteer to work for, and support, these organizations which benefit Ocracoke), because they have never sought non-profit status (perhaps because only one or two people just see a need and fill it), because they are governmental organizations, or for some other reason. I welcome corrections, clarifications and additions from readers. I posted this photo on the Village Craftsmen Facebook page yesterday. 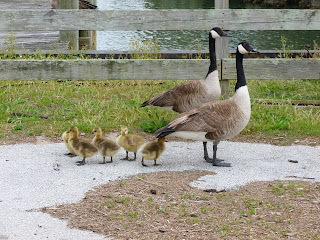 In case you missed it, one of the ferry personnel alerted Lachlan and me to a pair of geese and their goslings that were foraging down by the NPS Visitors Center. They are "cute some." Ocracoke Island is home to a year-round community of nearly a thousand creative, hard-working residents. Ocracoke is also a great place to relax...to walk on the beach, catch up on your reading, visit friends & neighbors, or take a nap. 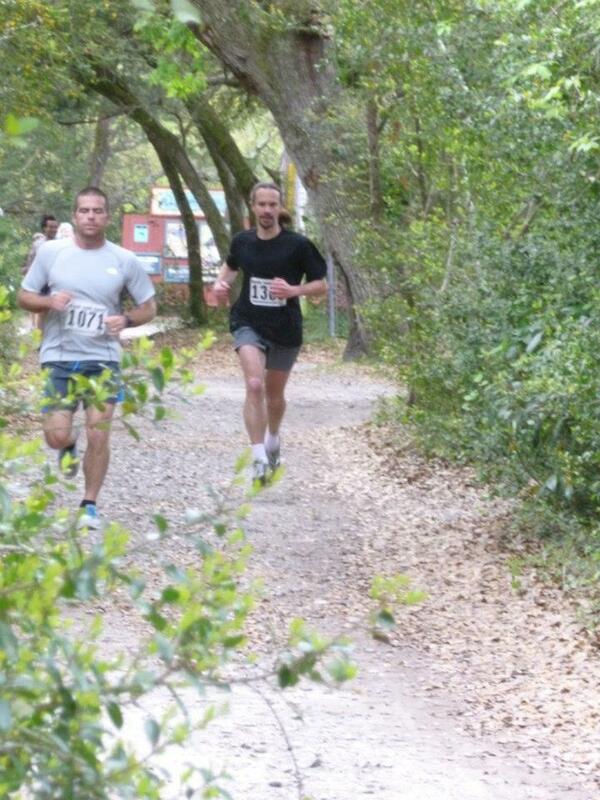 Ocracoke also has plenty of activities if you want to get out to meet other people or get some exercise. This evening at 7:30 Ocracoke Alive, our local cultural, artistic, educational, and environmental non-profit organization, is sponsoring another traditional Ocracoke Island square dance at the Community Center. The dance is easy to learn, and lots of fun. Everyone is invited. I was struck by the list of people who "make it happen" on page 6. More than 50 individuals (from eight years old to eighty years old) are listed...folks who have "donated photos" or "helped move anchors" or "painted a table" or "found and ordered a new sound system" or helped out in some other way. Just the other day I was told there are 29 non-profit organizations working on Ocracoke to make this a vibrant and dynamic community. Many thanks to everyone in our community who donates time, money, talent or expertise to "make it happen." Every year the Ocracoke Needle and Thread Club donates a new, hand-made island quilt to the Ocracoke Preservation Society for a fund-raiser. The quilt being raffled off by OPS this year is a quilt like you have never seen before…and may never see again! The center Ocracoke Lighthouse square was designed and meticulously hand-appliqued and hand-quilted by Jane Griffin. The surrounding lighthouses were designed and beautifully hand-appliqued by Cindy Hichens and Ann Borland. Cindy also pieced the corner Mariner’s Compass squares. Then, the Ocracoke Needle and Thread Club gathered to add the border, binding and hand-quilt this usable art piece. This quilt is dedicated in memory of our fellow quilter and loyal volunteer at the Ocracoke Preservation Society Museum, Rosemary Howe Wetherill (1927-2012). She taught us not only about quilting but also about how to enjoy what we have. She was an inspiration to us all with her feisty spirit and her love of color and crafts. We miss her very much. 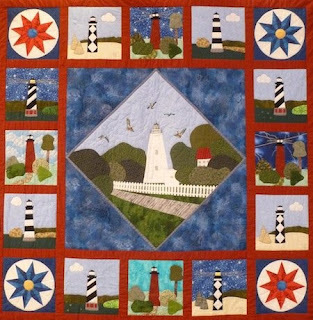 To purchase raffle tickets ($1 for one ticket, $5 for six tickets, and $10 for twelve tickets) for this outstanding quilt, contact the OPS Museum directly at admin@ocracokepreservation.org or call 252-928-7375. For more information visit http://www.ocracokepreservation.org/index.php/programs/special-events. Several days ago I mentioned Wilson Tilmon Farrow, Sr. (1798-1880), Ocracoke resident and member of the state legislature. In 1835 he was working with an attorney in Boston to unravel the details of suspected criminal activity on Ocracoke (we're still trying to figure out exactly what happened...and we'll let you know if and when we do). One of Wilson Tilmon Farrow's children was Edward Farrow (1839-1878). Edward Farrow was appointed Postmaster for Ocracoke in 1875, at age 36. He died three years later, and is buried in the yard at Berkley Manor. Edward Farrow has one of my favorite epitaphs: "Farewell Ed." The Ocracoke Post Office is an important part of community life. We do not have home delivery on the island, so everyone stops by the post office regularly to pick up their mail. Most folks visit the Post Office daily. 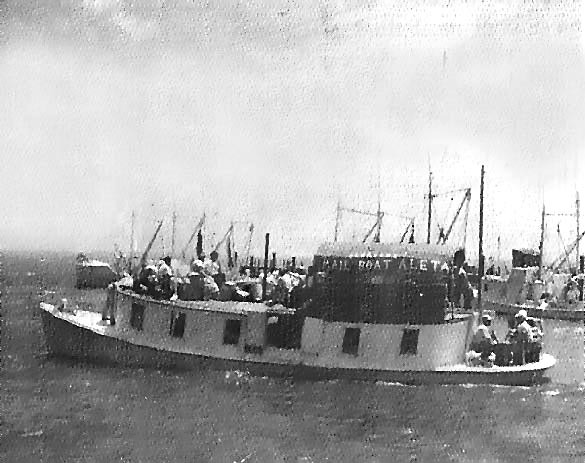 Our Ocracoke Newsletter for April is a history of the Post Office on Ocracoke, with photos of the earliest buildings, the mailboat Aleta, and Frazier Peele's first ferry across Hatteras Inlet. The NC Maritime Museum in Beaufort, NC houses a state-of-the-art exhibit of Blackbeard's flagship, the Queen Anne's Revenge. The remains of this vessel were discovered in 1996, just outside Beaufort Inlet. This ship, which Blackbeard ran aground in June, 1718 in order to break up his company of 300 to 400 men (thus allowing Blackbeard's select group of pirates to divide the plunder) has lain relatively undisturbed for nearly 300 years. In recent years the Queen Anne's Revenge has been painstakingly explored by marine archaeologists, and many artifacts have been recovered, interpreted, and preserved. The museum exhibit includes maps, tableaux, history, and numerous artifacts including cannons, gold, anchors and everyday items on board a 16th century vessel. Anyone visiting eastern North Carolina would be amply rewarded by stopping at the Maritime Museum in Beaufort. You can read more about the QAR project here: http://www.qaronline.org/About.aspx. Our latest Ocracoke Newsletter is a video of Philip Howard telling the story of the 1861 wreck of the Black Squall. You can watch it here: http://www.villagecraftsmen.com/news032113.htm. The Queen Anne's Revenge (QAR) was originally a French slave ship named the Concorde. Blackbeard captured the Concorde near the island of St. Vincent on November 28, 1717 and transformed her into his flagship. The Concorde was a large vessel that carried 14 cannon and a crew of 75 men. 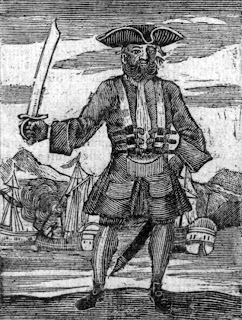 Edward Teach (Blackbeard) increased the armament to 40 cannon when he renamed her the Queen Anne's Revenge. 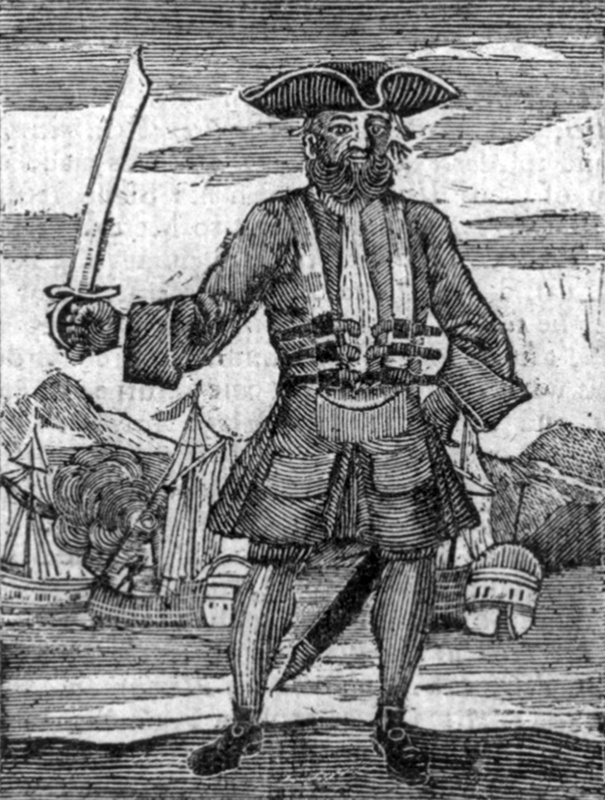 Along with smaller sloops, Blackbeard and his crew of 300 - 400 men terrorized shipping throughout the Caribbean and along the east coast of North America. 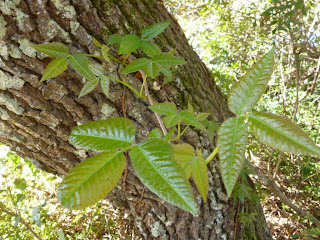 Springtime on Ocracoke Island means fig trees coming back to life and sprouting bright green leaves. We will have to wait until late summer before the figs ripen and we can feast on the tasty fruit. Actually, however, the fig is not a fruit. Biologist Richard Dawkins describes the fig as a "garden enclosed." For a fascinating account of the mutualistic relationship between figs and fig wasps read chapter 10 of his book, "Climbing Mount Improbable." I am no expert on figs, but I believe most garden-variety figs in this country, including Ocracoke Island figs, are not dependent on fig wasps. I think they are parthenocarpic, and develop without pollination. New fig trees grow from cuttings, or from branches that bend to the ground and grow roots. Look for fig trees in yards throughout the village. And later this season look for delicious Ocracoke fig preserves for sale at Village Craftsmen. They are an island delicacy. Yesterday morning I joined several other islanders and visitors to hear Alton Ballance's presentation, Sea, Sand, and Human Hands, the Changing Face of the Outer Banks, at the NCCAT center. Alton is an Ocracoke Island native and senior fellow at NCCAT (North Carolina Center for the Advancement of Teaching). Alton first took us up into the cupola of the Center (the former US Coast Guard Station) where we had a commanding view of Ocracoke Village, Pamlico Sound, Ocracoke Inlet, and Portsmouth Island. Then we proceeded to the conference room where Alton spoke about Outer Banks geology and shared photos from a Power Point presentation. Alton's talk was informative and quite interesting. Among other things, I learned why Ocracoke Inlet is so stable (it is the only Outer Banks inlet that has been continuously open since Europeans have been keeping records). 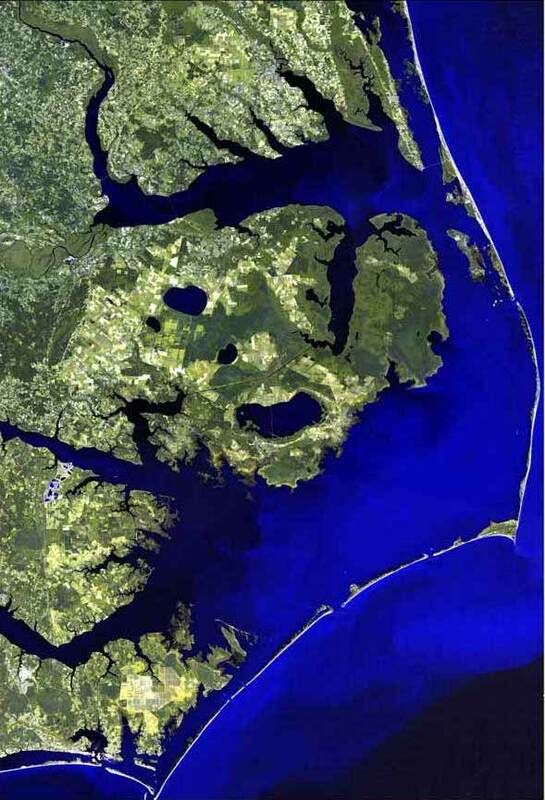 Ocracoke Inlet is actually an extension of the Pamlico River system. 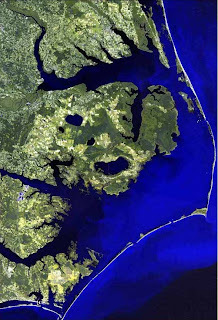 The Pamlico River empties into Pamlico Sound (just below center in the above image). Following a gently curving arc its flow eventually arrives at Ocracoke Inlet. As Alton reminded us, the dynamic nature of the North Carolina coast ensures that "human hands" will be struggling with the "changing face of the Outer Banks" for quite some time. "Ocracokers have long dreamed of a green space dedicated to recreation, a patch of grass large enough for baseball, soccer, or other field sports. Over the years as the island's small amount of buildable land dwindled, the likelihood of finding and affording a large enough tract became more and more remote. "[T]he Baseball Committee joined forces with the Ocracoke Youth Center, a local 501(c)(3) nonprofit. 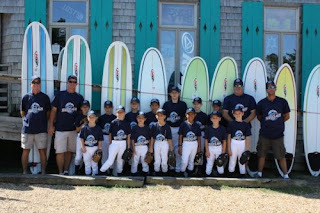 The Youth Center was established in 1995 and provides recreational support to children and families on Ocracoke Island. Together their project mission became the purchase and development of land for a ball field and other recreational use. In December of 2012, the first step towards our 'field of dreams' was completed with the purchase of the last land within the village suitable for our purposes. Our new Ocracoke 'Community Park' will include a sports field for baseball and soccer and plans for a 2,400 square foot Activities Center." And look for more information about this exciting project in the coming months. Early Monday afternoon a crowd gathered alongside NC Highway 12 to witness the groundbreaking ceremony as construction of Ocracoke's new Fire Hall got underway. It was a celebration of community spirit, a demonstration of people working together for good, a small town illustration of what is best in the human spirit, a ray of hope amidst unspeakable national tragedy and evil. Land for the new building was donated to the community by Julia Hutcherson and her son Tommy. In recognition of their generous donation Tommy and Julia had the honor of turning the first shovels full of sand. The new Fire Hall (the current one is located on the Back Road) will be built on Highway 12 next to the El Faro restaurant (the former Flying Melon restaurant, which has moved to the Back Road). 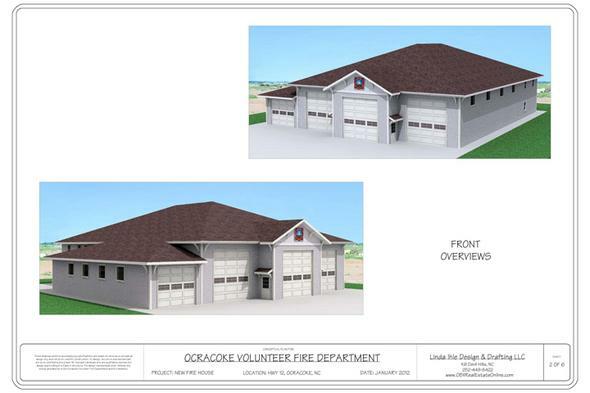 You can learn more about the Ocracoke Volunteer Fire Department, here: http://www.ocracokevfd.org/ . These are men and women who give so much to our community, like fire fighters, police officers, and others throughout our country who respond to natural and man made tragedies. A heartfelt "Thank You" to all. Donations can be made on the Fire Department web site (look for the "donate" button), and are especially welcome now. As most of our readers know, Ocracoke is a small village, but we require fire equipment and personnel adequate to protect our much larger seasonal population of residents, property owners, and visitors. Every donation is welcome and much appreciated. Ocracoke at times seems like a world away from the rest of society. However, we islanders are shocked, saddened, and angered when horrific things happen to our fellow citizens anywhere. Our thoughts go out to the victims and families of everyone killed and injured in the senseless attack on innocent men, women and children at the Boston Marathon. At times like this we often feel helpless, but we can at least hope for justice, healing, and comfort for everyone affected, and for our country and our world. May we one day learn to live in peace, and may that day be not long in coming...for us, our children, and our grandchildren. -- Monday, April 15 at 2 p.m.: Groundbreaking Ceremony for the new Fire Hall at the soon-to-be construction site on Hwy 12. -- Tuesday, April 16, from 6-8 p.m.: Community Park Information Open House at the Community Center. Exciting news about plans for the new Ocracoke Community Park and ball field. -- Wednesday, April 17 at 10:30 a.m.: Sea, Sand, and Human Hands, the Changing Face of the Outer Banks at NCCAT. Ocracoke campus: Wednesday, April 17 at 10:30 a.m.
Join NCCAT faculty and staff for a presentation and discussion about how the sea and shifting sands impact the lives of Outer Banks residents. What challenges have recent northeasters and hurricanes, such as Irene in 2011 and Sandy in 2012, had on the Outer Banks transportation system, economy, and environment? What lessons can we learn from past events and how residents adapted to this constantly changing region of North Carolina? Ocracoke campus: Wednesday, April 17 at 1 p.m.
What are the key factors, human and natural, that contribute to this marine ecosystem? Learn more about our state’s marine fisheries and how they contribute to the economy, culture, environment and fun of our state! ...Shiny as gold, but if you touch it, you're certainly bold! It is spring, and poison ivy is bursting forth around the island. Leaves of three?...Let it be. Don't touch it. The itch and rash are no fun. Ocracoke Lighthouse was built in 1823. One year before that, French physicist Augustin-Jean Fresnel invented the compact lighthouse lens that bears his name. The Fresnel Lens is actually a remarkable series of prisms that capture and focus light, allowing a lighthouse beam to be visible many miles off shore. 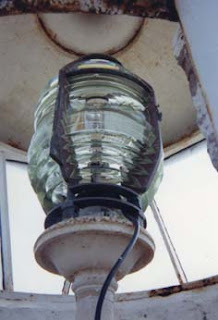 Originally the Ocracoke Lighthouse was equipped with a simple reflecting illuminating apparatus. By 1854 the superiority of the Fresnel Lens was acknowledged, and such a new lens was installed. Ocracoke's light is magnified by a fourth order Fresnel Lens with a focal length of 250 mm. Although the lighthouse was originally built to guide mariners through Ocracoke Inlet and into deeper waters of Pamlico Sound, its steady beam can be seen 14 miles to sea. In 1835 Wilson Tilmon Farrow, Sr. wrote a lengthy letter to an attorney in Boston, requesting his help regarding a "rascality" on Ocracoke that had something to do with the "robbing" of a vessel. Islanders somehow involved in this affair included William Howard (grandson of Ocracoke's first William Howard), his son-in-law Captain Elijah Chase, John Pike (island shopkeeper), and Jacob Gaskill (Ocracoke's Justice of the Peace). Elijah Chase, descendant of prominent New England sea captains, and his wife Thurza Howard had left the state heading west, and "cannot be found." Allegations were made about "a warrant against one Capt. Weeks for an uncurrent [outdated or illegitimate] bank bill which Gaskins [Gaskill?] said the Capt. has passed to him." Tilmon Farrow wants to "add to the case Willis Williams...."
In 1837 Jacob Gaskill gets into an argument with Willis Williams (Gaskill's cousin), and shoots him in the neck. Williams dies immediately. This is Ocracoke's first murder. When Anna dies in 1845 Tilmon Farrow marries her sister Dorcas Credle, widow of Willis Williams. Anna and Dorcas have an older brother named Tilmon Farrow Credle (there must be a family connection). Tilmon Farrow's son, Edward, marries Lucretia Credle Wahab, niece of Thurza Howard Chase. I may never solve the mystery (what ship was robbed, what connections do all of these people have with each other and with the alleged crime, what was the argument that led to the murder, how does it all fit together, etc.) but it's fun trying...good mental exercise, like playing detective. I'll keep you posted if I make any headway. Every once in a while I am still surprised by something I discover about Ocracoke. Just this morning, glancing through the 1870 census records I noticed that Tilmon Farrow, age 70 is listed as "Member of Legislature." A quick search of the Internet suggests that Farrow was a lawyer, and, as a younger man, was involved in several interesting cases involving Ocracoke natives. I recently began reading James E. White's 2012 book, "Paradise Lost, An Oral History of Portsmouth Island." In 1880 the population of Portsmouth had declined to 226 people. White remarks that "Education that year is very interesting to say the least." He explains: "Lilian Hancock was given as the school teacher, even though she was listed as being illiterate." I guess they did the best they could, with the resources they had! The winter chill has finally retreated. The sun is shining, the sky is a welcoming azure hue, and folks are out and about all over the island...walking dogs, painting fences, digging in gardens, working on boats, and strolling along the seashore. And tulips are popping up throughout the village. Spring has arrived. Readers Jack and Toni commented on Friday's post. 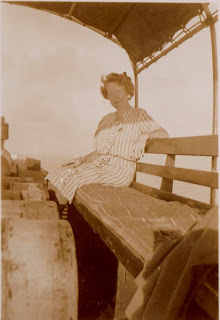 They had followed the link to view a number of Greg Pawelski's vintage Ocracoke Island photos. They were particularly interested in the Berkley Manor. The Manor was one of several structures built by Sam Jones in the 1950s (see my biography of Sam at http://www.villagecraftsmen.com/news012111.htm for more information). Sam also built Berkley Castle which is now operated as a Bed & Breakfast. 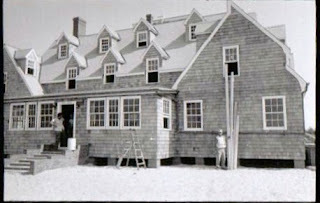 All of Sam's buildings were of a similar architectural style, an idiosyncratic "Colonial Revival combined with distinctive shingled towers and numerous dormers." One Hatterasman visited Ocracoke soon after Sam had finished most of his buildings and remarked that "Sam Jones has shingled Ocracoke!" Mary Ruth Dickson is Sam's granddaughter. Her father, Charlie Jones, died recently, and Mary Ruth has been sharing her father's photo collection. The photo below was taken while Berkley Castle was still under construction. We've never been able to verify the following story told by Charles T. Williams II in his 1975 book "The Kinnakeeter," but it is intriguing. "...They intermarried and took unto themselves the young Indian lasses for their brides and raised children. Caleb Williams gave his wife an English name -- he named her Sarah; David O'Neal called his wife 'Morning Dew,' and Elijah Scarborough name his wife 'Olive.'" Perhaps one day we will know the truth. In the meanwhile, it is fascinating to think that Native American blood still runs through the veins of most, if not all, historic Outer Banks families. 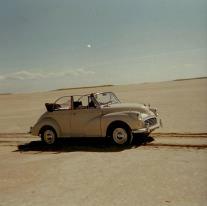 Here's a fun photo taken at South Point more than 40 years ago by Greg Pawelski. He was kind enough to send it to me. You can see more of his pictures on our FaceBook page. Just click on the link to the right. 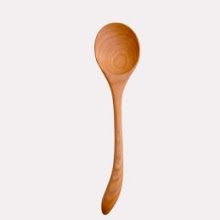 ...a Western form of meditation." So says my neighbor, Ann Ehringhaus. And I think she is correct. I have been laid up with a major head cold for several days now. Don't want to do much more than sleep and read. I will be back at my blog soon. I have read five books (actually I'm still reading two of them) in the last few days, though -- The Master Butcher's Singing Club, She, The Good News Club, Ocracoke Between the Storms, & An Anthropologist on Mars. And I've learned three new words (all from An Anthropologist on Mars): hebetude, apocope, and chthonic (I had encountered this one before, but couldn't remember the definition). So, I am resting and learning. It could be worse. 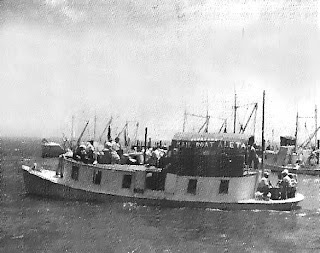 Every now and then I mention the old mailboat Aleta on this blog. (You can use the search box at the top left to read past posts.) The photo below is one I have published before. It will give new readers an image of the boat. Several days ago Mary Ruth & Paul Dickson sent me copies of many of Mary Ruth's father's snapshots from the 1950s. This next photo is from Mary Ruth, and has only recently been published. The woman is sitting on one of the benches under the canvas cover. This was the most comfortable place on the vessel. You will notice that the captain decided to also bring aboard a load of barrels.The poor woman only has just enough room for her legs. Passenger amenities were in short supply on this voyage! Ocracoke has a long history of cordial relationships with the National Park Service. Of course, there are occasional frustrations with any bureaucracy, but the latest news is worrisome...and, we think, just plain silly. According to official sources, an unusual strain of fungus has been reported on Outer Banks beaches. In the last few months several children walking barefoot on the beach have contracted this fungal infection. In a case of monumental over-reaction, those in charge have mandated that until further notice, no one is permitted to walk on the beach without shoes. Please take a moment to read the press release from the opposition (at least they have a sense of humor!) and sign the petition to stop this ridiculous rule: Fighting for the Soles of our Children.